Hallmark Keepsake Ornaments are a Christmas staple, right? From the first year they came out, my mother bought my sister and I each one. She even kept the boxes so that we would have them to safely take with us when it was time for each of us to start our own tree. As far as decorating the rest of the house? We were on our own. Thankfully, Hallmark’s gone beyond just cards and ornaments. 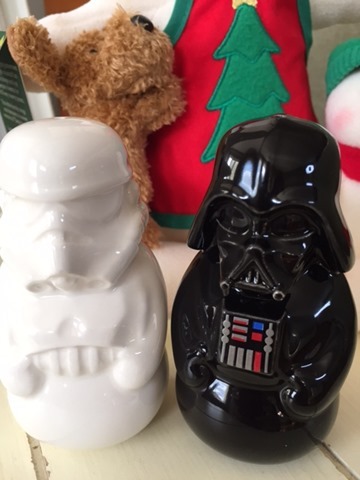 Here’s a quick round up of some of this year’s offerings, including a giveaway for what is sure to be one of this year’s biggest hits – the Star Wars Salt & Pepper Shaker Set. What is the one thing you absolutely must clean when guests are coming over? That’s right – the bathroom. If no other room in the house is presentable, you will still get a pass if your ‘loo is sparkling. If you have a lot of people coming over, keeping the hand towel dry is a bit of a trick. 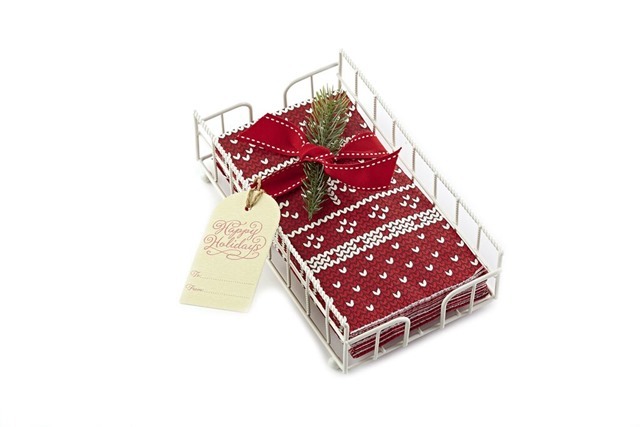 This guest towel and basket set (MSRP $16.95) has disposable printed paper towels so your guests aren’t left rubbing their hands on their good jeans because your hand towel has been over used. It would also make a great hostess gift. Growing up, Goose and his sister always had their own mini trees to decorate. Until the kids started outnumbering us, we did the same. 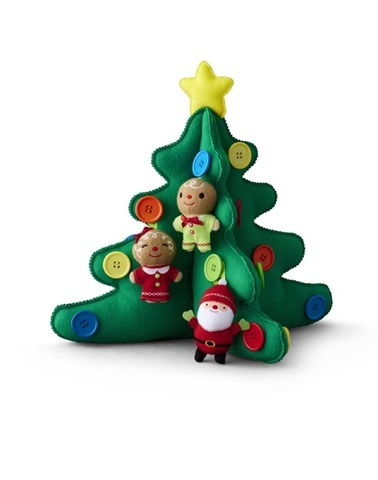 The Keepsake Kids My First Tree (MSRP $29.95) is a plush, felt tree adorned with giant buttons securely fastened to its limbs. The buttons are the perfect place for the Keepsake Kids Ornaments (MSRP $7.95). 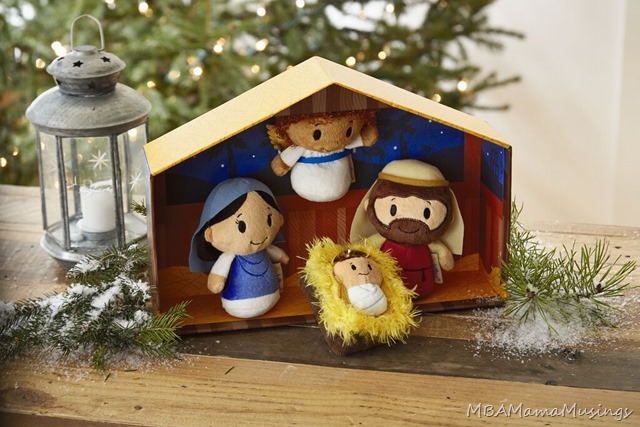 Speaking of things that are safe for the kids to play with, the itty bittys Nativity Set (MSRP $39.95) lets little fingers re-enact the first Christmas and leave your ceramic set alone. That would be unlike E1’s second Christmas, when The Master Seamstress had just purchased a Royal Doulton Nativity Set and he promptly knocked a shepherd’s head off. Christmas = baking. And tinsel. And trees. And wrapping paper. But most importantly baking. Increase the chances of getting some of those sweet treats with this tea towel and spatula set (MSRP $12.95). Now, I can’t guarantee that you’ll leave with a doggy bag if you bring this to your next shindig, but it will definitely increase the odds in your favour. 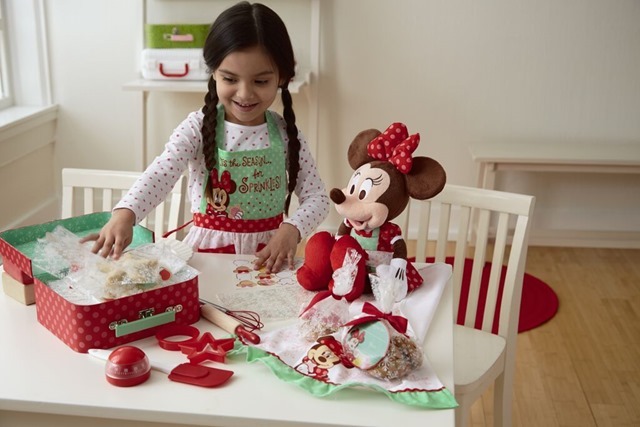 Speaking of baking, get them started young This year, you can outfit your favourite little baker with everything Minnie. 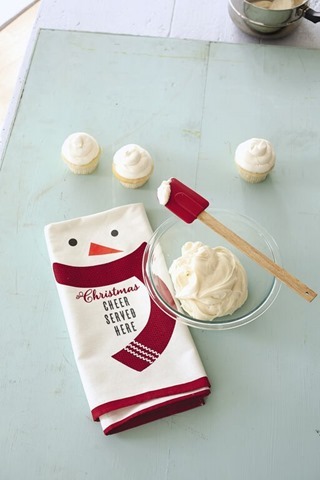 There’s a Baking Kit ($24.95), Apron ($14.95) and tea towel ($9.95). Think of the endless hours of fun and cookie dough sampling to be had. I am a total sucker for the singing Christmas snowmen. I have them all. Every. Single. One. And I put batteries in all of them. Every year. And the kids insist on starting all of them at once. Every year. This year, the Time for Cookies snowmen are singing their own variation of Deck the Halls. $17.95 with the purchase of any three cards. Now, here’s the really fun part for you. 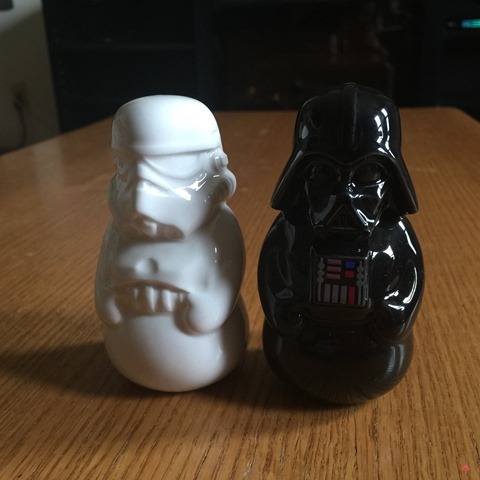 These Star Wars Salt & Pepper Shakers are likely to go like hot cakes. Since I don’t have a set myself (yet), a couple of my friends sent me pictures of the ones that they do have. 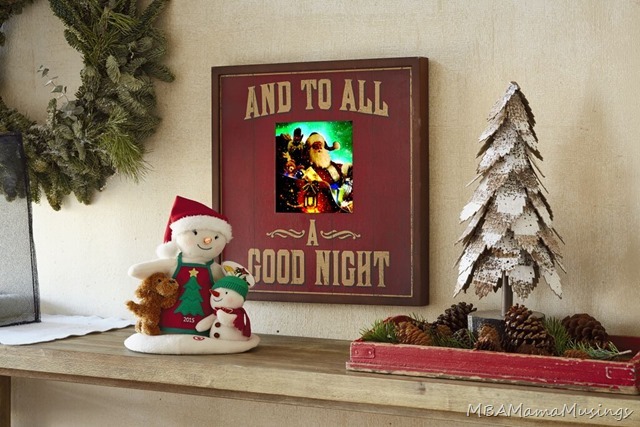 This one is from Paula over at Thrifty Mommas Tips. She only sent me a picture. Guess she’s keeping the shakers for herself. They’re a cross between a snowman and Star Wars. Alyssa from A Motherhood Experience also only sent me a picture. Looks like I am going to have to go buy some for myself. MSRP $19.95 for the set. You though, my lucky reader, can win a set in time for the holidays. Use the Rafflecopter form below to enter. Odds of winning will depend on the number of eligible entries received. Valid for Canadian residents only. Not responsible for lost or misdirected entries. Contest closes December 4, 2015 11:59 pm ET. Good luck! 86 Responses to "Hallmark Holiday Round Up & Giveaway"
Guess I'm going on the Naughty list because I'd keep them. Oh keep them! My kids are just getting into Star Wars so they'd love them. I'd have to keep them. I collect Salt & Pepper shakers. :-) I have an affinity to Star Wars though. Named my dog, Ewok. 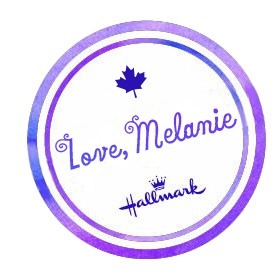 Hi Mel!! Mike would love these! Gift them! My brother loves Star Wars! Gift them; my brother-in-law would appreciate them a lot more than I would! I would gift them! The problem would be who on my list to gift them to! Keep them. I have two little fans and one BIG fan of Star Wars who would love these! Too cute, but I would gift them because I know someone who would love them more than I do! I would keep them! My son would love them! Gift. because its christmas time so if they arrive in time, why not let the perfect star wars lover have them? this contest shops better than i do! keep them - they are too cute, and so unique! I would have to keep them since I am a big Star Wars fan. i would gift them! Thanks for the amazing giveaway! I would gift these to my son. He would just love them. We would have to keep these!! I would gift them to my sister. She would love to receive them. Totally keeping these! My Son would love these! Gift them, not a Star Wars fan but I know someone who is! I would give these to my son who is a huge fan of Star Wars. I would give them to my brother. Gift them to my nephew. He would love this. oh i'd totally keep these for my 3 star wars boys! I would keep them :) Thanks. happy Holidays! I think my brother would love these - such a great Christmas present. Keep them! Are you kidding?!? These are amazing! My son would love these, so I would gift them to him! i would most certainly keep those !!! I would keep them, they're just too cute to give away. I would give these to my brother! Great gift! It's a tough call. It really is. I would have to think about it. I would gift them to my daughter and husband because they love Star Wars, the office is full of different Star Wars items and both their dogs are named after Star Wars. I would gift them, although they are adorable. I would be gifting them. My sister has star wars ornaments, these would be added to her star wars collection. Gift them! I have a friend who is a HUGE tar wars fan! gift to my brother a star wars fan since childhood !!!!! I'd have to give these to my husband. Keep them for sure those are awesome!! Gift them! I lnow someone who would love them! I would gift them. My friends are big Star Wars fans! Gifting to the dark side! My in-laws would love this!